Exotic Adventures, depicts the French Foreign Legion at the turn of the 19th Century in Northern Africa, immortalised in the stories of Beau Geste by P.C. Wren along with it’s movie adaptations and numerous boy’s own and pulp stories of the 1940’s and 1950’s. 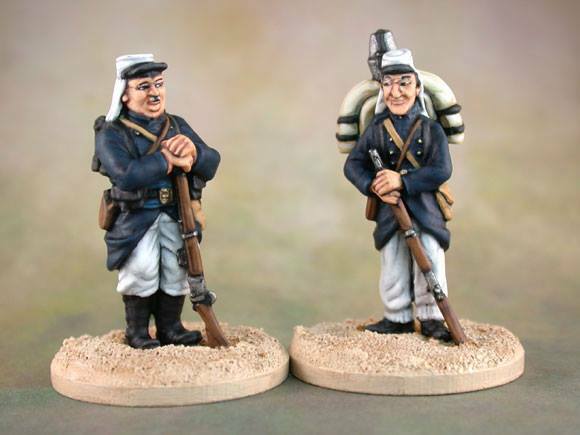 You can find the full range of 28mm miniature French Foreign Legion in our shop. The range also covers The Tuaregs – the Blue Men of the Nile, who resisted the French colonial invasion of their Central Saharan homelands. They are depicted with their traditional weapons, the Takouba broad sword, the Jezail long musket and with the Remington rolling block rifle which was adopted from the late 1800’s onwards. Our 28mm Tuareg Berbers are designed to be suitable from the Dark Ages to the early 20th Century, the poses with rifles should be confined to 1880’s onwards. The figures can be used for any North African tribal peoples or Arabic Nomads, all you need is to paint the colour of the robes to suit the desired outcome. Tuareg Berbers from Packs: TA1, TA2 & TA3. You can find the full range of 28mm miniatures Tuareg Berbers in our shop. The range also includes a number of Character Sets that depict popular fictional characters from the period found in Art, Cinema and Literature of the 1890 – 1920’s, such as Stan Laurel & Oliver Hardy from their 1931 short – Beau Hunks. At Unfeasibly, we design & produce highly accurate, true scale (1/56) 28mm miniatures in white metal (pewter), for wargames, modellers and collectors, available from our shop.